Back in stock! 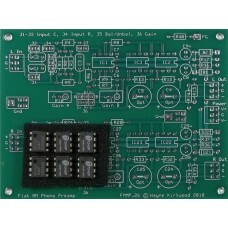 This is the bare PC board and ICs for the Flat Phono Preamp project published in the Pro Audio Design Forum. The Flat Phono Preamp is designed for the LP archivist, mastering facility, record manufacturing or any professional application requiring high quality, low-noise, no-nonsense Flat playback for moving magnet or moving iron cartridges. 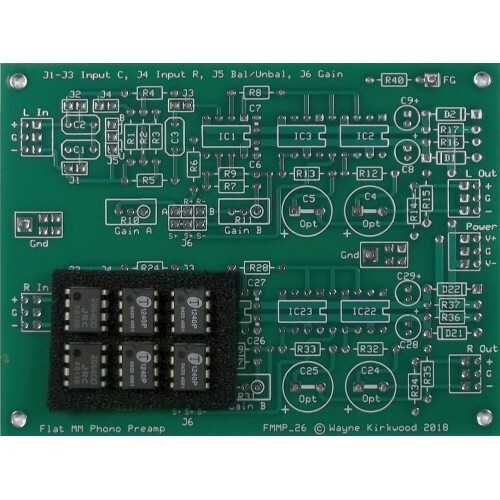 The Flat Phono Preamp board is a fully balanced instrumentation amp designed specifically for direct coupling to moving magnet phono cartridges or moving coil carts using external transformers. The flat, non-equalized preamp is ideal for RAW archival transfers where RIAA or custom EQ is applied in DSP. When paired with the RIAA EQ Monitor Switcher a fully-analog path with RIAA EQ is possible. The fully-differential input connections are jumper-selectable for either balanced (floating) tonearm wiring using shielded twisted pair cables or unbalanced grounded RCA coaxial interconnect. Highest hum rejection is realized when the input connections are fully-balanced. Using either input configuration common mode rejection is realized on-board using a pair of high-accuracy THAT1240 line receivers in a "double-balanced" cross-coupled output. Jumpers on the Flat Phono Preamp select either 47K or 100KΩ resistive termination with capacitive terminations of 0 to 200 pF in 50 pF steps. Two sets of jumper-selectable gain adjustments are available for setup with different sensitivity carts or disc reference levels. Both jumper settings range from +14 to +40 dB. (Balanced outputs are 6 dB higher in level and range from +20 to +46 dB). The Flat Phono Preamp is fully DC-coupled from cartridge to output owing to its low bias current balanced input and DC common mode rejection. A unique advantage of the Flat Preamp is its ability to be remotely located at the turntable and powered by bipolar DC. This permits cartridge leads to the preamp to remain short allowing long low-impedance output signal lines to feed the RIAA EQ/Monitor Switcher or Workstation A/D converter. The split preamp configuration is ideal for cutting lathes, archive facilities and residential settings where separation from the lathe or turntable and the workstation or transfer console is needed. This is the Phono Transfer System based on the Flat Phono Preamp and RIAA EQ/Monitor Switcher proj.. This is the Flat Phono Preamp project published in the Pro Audio Design Forum. The Flat Phono P..
Back in stock! This is the bare PC board and ICs for the Flat Phono Preamp project published in th.. This is the Phono Transfer System RIAA EQ/Monitor Switcher project published in the Pro Audio..